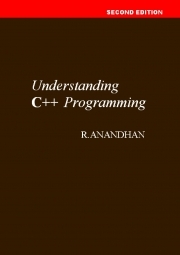 Description of "Understanding C++ Programming"
Helps understand C++ programming fundamentals. Helps understand Object Oriented Programming concepts. Is tailored to suit the learners’ needs. Can be used as a textbook as well as a reference book. Contains True/False Questions and Answers. Contains Multiple Choice Questions and Answers. Contains Review Questions and Answers. Helps students prepare for tests and exams. The Nilgiris – 643 204. History:	Sivasailam Chamraj Higher Secondary School, Chamraj (2002-now). Holy Angels Matriculation HSS, Mettupalayam (1997-2000). Area of Specialization:	Teaching Engineering Subjects and Programming Languages and English. Reviews of "Understanding C++ Programming"